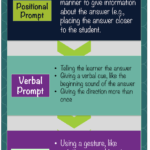 Students with ASD often struggle learning vocabulary. A few years ago a colleague and I were talking about the difficulties that many of our students have with learning and generalizing vocabulary that is relevant to their daily lives. We were brainstorming ways to accomplish two goals in language instruction. 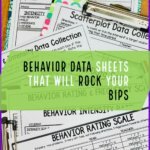 First, we wanted instruction to focus on vocabulary that was relevant to their daily lives, but most of the common resources and instructional programs, particularly for young children, focused on much vocabulary that wasn’t relevant. 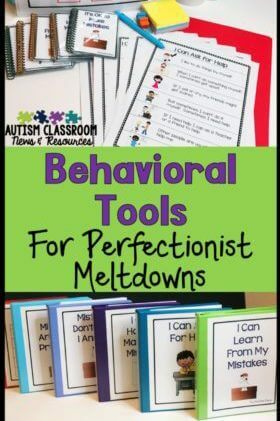 For instance, many common books and resources focused on zoo animals and farm animals for children who needed to focus on identifying their shoes and their backpacks. the second goal for instruction was to help students generalize their vocabulary from discrete trials or similar types of programs in 1-1 or small group settings to larger group settings and reading for literacy. Students use photo cards in discrete trial programs for learning new vocabulary words; but most books use line drawings or illustrations rather than real photos. This made generalization to morning meeting and literacy activities difficult without instructing on the illustrations themselves. 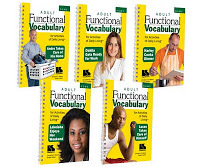 For students with significant disabilities, we wanted to be able to focus instruction on the vocabulary that was relevant to their life and would be most likely to generalize to real life. Our solution was to develop books that had everyday vocabulary with photographs in the format of books to use the vocabulary in literacy instruction. We added a repeatable phrase that can be recorded on speech generating devices, the ability to match pictures within the books, and cloze sentences with picture cues for the students to complete. 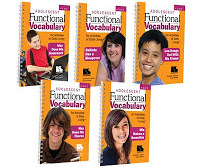 The result was the set of Linguisystems Functional Vocabulary for Children books seen on the left that were published about 5 years ago. 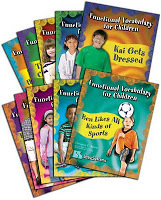 More recently, we began that realize that for older students with significant disabilities, we found that there were few resources that focused on simple reading levels with meaningful and commonly used vocabulary. 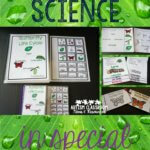 Instead, teachers had to either make their own books with pictures from the student’s experiences or use books and materials designed for younger students. 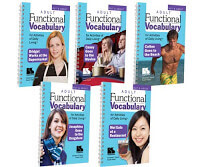 So, to address this need, Susan Kabot and I have now written the Functional Vocabulary for Activities of Daily Living, also published through Linguisystems. These books come in sets of 5. There are 5 focusing on middle schoolers and adolescents’ activities at home and another 5 for the same group of community activities. Similarly there are 5 focusing on adult activities at home and 5 focusing on adult activities in the community. 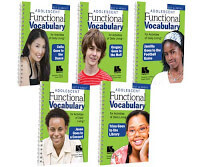 Each book has a repeatable phrase for recording on speech generating devices, cloze sentences for the students to complete with visual supports, and pictures that can be cut out for matching as needed within the book. We are very excited about these books and think they will be a wonderful resource for teachers of middle and high school students, habitation and group home staff working adults with severe disabilities, and families looking for literacy activities for their adolescents and adults with severe disabilities. Over the next few weeks, I will focus on ways that you can use a variety of interactive books in different activities across a variety of ages. I encourage you to share your ideas and applications of interactive books in your classroom or home and I will highlight different practices for individuals who are nonverbal, individuals working on expressive vocabulary, and the use of these types of books for literacy and basic reading. Stay tuned for more, in the meantime, checkout the links below from the Linguisystems site for sample pages. I have been looking at these books and wonder if they are worth buying. What do you think? Are these books good for high school kids? Hi Jamie, I am kind of biased because I wrote them, but yes I think they are worth buying. There are 2 sets for high school students–the adolescent version–of the pictures at the end of the post that would be very appropriate for students in a functional curriculum in high school. You can see previews of them on the Linguisystems site. I hope that's helpful.